It’s hard to believe it’s been just nine weeks since I was sworn in as mayor of Boston. A lot has happened, and my administration has made great progress in key areas. We’re working hard to tackle the most urgent challenges directly and build a foundation for long-term success. 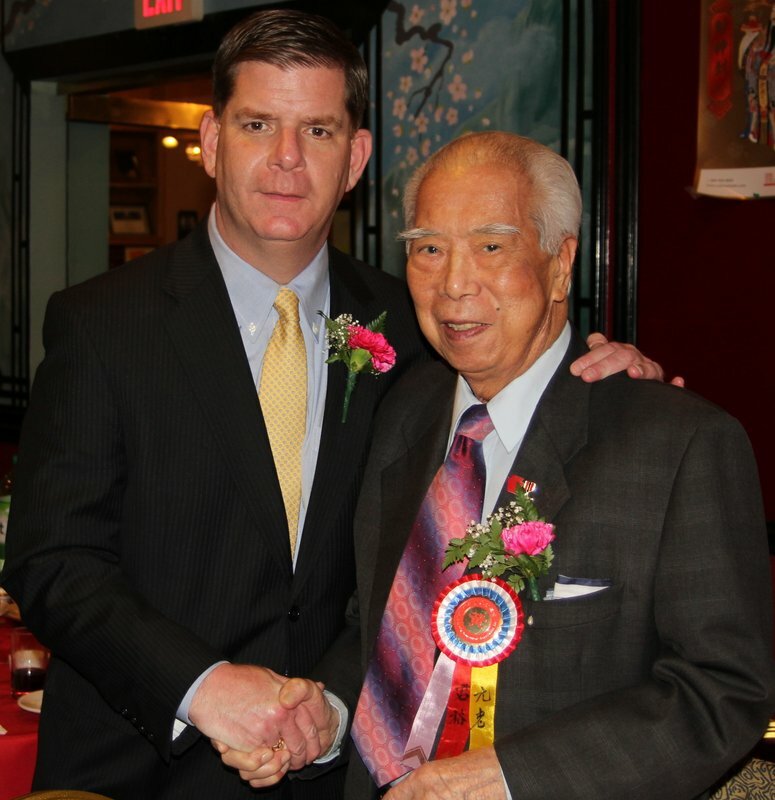 Mayor Walsh with WWII veteran Arthur Wong at Empire Garden restaurant in Chinatown (photo by David Li). In public safety, we’ve listened to survivors of violence and community leaders, and with their input, we’re developing a comprehensive safety initiative to support violence prevention in our neighborhoods. We’re bringing a wider range of city agencies – including public safety, public health, schools, public housing, and community centers – to the table in our effort to address the root causes of violence. In January, we appointed the most diverse command staff in the history of the Boston Police Department. For the first time, our command staff accurately reflects the population of our city. In education, we have put together a diverse search committee to find the next Superintendent of the Boston Public Schools. I’ve charged this team with conducting a national search to find a proven leader, someone dedicated to closing the achievement gap and putting our children on pathways to good careers. Starting this week, we’ll hold six public hearings across the City to make sure parents, students, and the entire community have a voice in this decision. Again this year, we’ve seen shortfalls in federal and state funding for education, but I will never shortchange our kids. Even in these difficult fiscal times, I’m committed to expanding pre-kindergarten seats and reforming our high schools. In economic development, we have kept Boston moving. Projects across the City are advancing from approval to groundbreaking and to ribbon-cutting. And because we’ve kept the pipeline open, dozens of innovative projects are moving forward: the expansion of the Landmark Center in the Fenway; affordable housing in Chinatown; a surplus-energy building in Mission Hill; and startup space in Allston. Last month, I appointed John Barros to my cabinet and have tasked him with revitalizing the way we approach economic development in Boston. In this role, John will focus on fostering economic development in all of Boston’s neighborhoods through ensuring access to employment, pathways to careers, and strong job growth. For the first time in Boston’s history, we’ve received perfect AAA bond ratings from both Moody’s and Standard & Poor’s. This upgrade will save us real money, and it reaffirms our bright prospects for the future. As I prepare to bring my first budget to the City Council next month, we will not do anything to jeopardize this status. We will present a balanced, smart budget. By embracing efficiency, we can be lean and provide the same level of service. By embracing innovation, we can take our services to another level. There’s lots of hard work ahead, and my team is up for the challenge. But City Hall can’t do it alone. I urge you to get involved – attend community meetings, engage with your local BCYF community center, and give my office a call anytime at 617-635-4500. I look forward to your partnership, as together we make Boston the greatest city in the world.